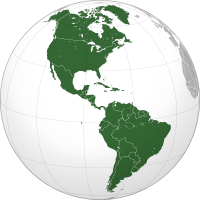 America, also known as the New World, is the second largest continent and is divided into North, Central and South America. It’s also the first continent we plan to visit during our round the world trip. At first, we plan to visit South America, and then fly directly to North America. In South America we have to deal mainly with Spanish and Portuguese, both languages we ​​obviously do not know. But if we are lucky we’d like to learn at least some basic phrases in order to be able to communicate with the locals. If we succeed or not, you can read on our blog and also in the preparation section. The first country we will visit will be Brazil, the largest and most populous country in South America. We look forward to the amazing atmosphere of the most famous carnival in the world, but also the spectacular waterfalls, located at the border with Argentina. Argentina will be our next destination. We will examine here the capital city and then head south towards the rarely visited beauty of Patagonia. Our trip around the world will take us through Patagonia to Chile. But it is not the only nature that we want to see there. From the quiet and unpopulated Patagonia we will move directly to the capital of this country. After seeing the local sights and getting to know the local people we want to take a long bus trip on the Pan-American Highway to the seaside resorts located in the north of Chile. From there we will move to neighboring Peru by local taxi called colletivo, like many other travellers. In Peru we want to explore historical monuments from the times of the Incan Empire and go to the places where once lived local Indians. Here we say goodbye to South America and fly northwards. In North America it will be very easy for us, except Mexico, because we can speak English quite well. So there everything will run smoothly. We will visit Mexico in North America as the first destination in our travel plan contains. In Mexico we will follow the footsteps of the Aztecs, Olmecs and Mayans. We cannot wait for our traveling through these mythical places and civilizations. It will be the first time for us to see pyramids with our own eyes. And in addition to visiting these historical places we want to enjoy ourselves on one of the beaches in the Caribbean. But we will enjoy bathing in the sea in the USA as well. We will arrive in sunny Florida. From there we will do a road trip through the States. A part of our round the world trip will be to visit of the largest country on continent, Canada. In Canada we will exclude the countryside this time and focus mainly on the large cities. But we won’t miss the Niagara Falls. We will end our traveling in America on the island of Hawaii, from where we will fly across the Pacific Ocean by plane to distant Asia.